A Regina couple took a chance on a stray dog and ended up falling in love. Jason Hubbs and Loralyn Koffler-Hubbs met Chance, a very sick stray, while in South America on a cruise. It wasn't the couple's intention to adopt him — they were just trying to do something to help him out — but now he's a part of the family. During a cruise stop at Puerto Montt, Chile, Jason suggested visiting a fish market. That's where they met the lonely stray. Most stray dogs the couple saw in South America were well taken care of. They had shiny coats and were a bit overfed. That's why this dog stood out. He had mange and scabies. "We couldn't physically leave him," Loralyn said. The couple learned that locals couldn't afford the vet bills to care for the dog. When they first called to try to find someone to take care of the dog, they were speaking with a woman who kept referring to him as "their dog." "After that, we looked at each other and said, 'I guess it's our dog.' We got to do what's right. No questions asked," Jason said. After a visiting the vet, the couple made some negotiations to keep the dog for a month and eventually take him home. This all happened within three hours of meeting the dog. When they took him to a local vet, he was so sick that he had to be sedated and put on IV fluids for the first three days. They said they named the dog Chance because they found a vet who took a chance on them and now Chance is taking a chance on the couple. 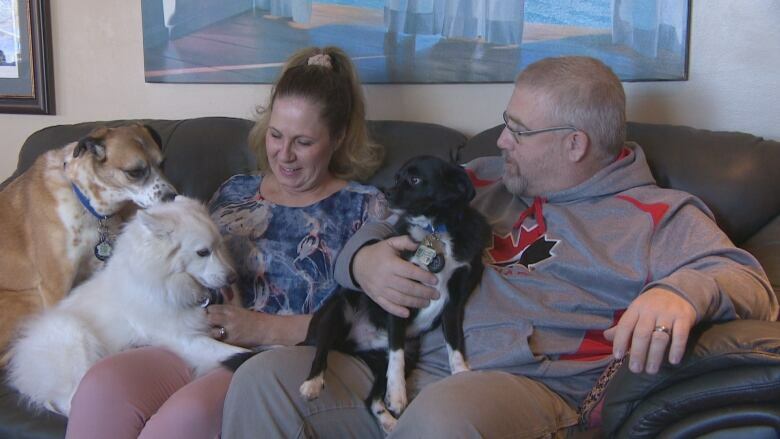 The couple arranged for Chance to be neutered and given vaccinations so he could be allowed into Canada. After rearranging their flights and filling out the proper paperwork, they were able to take Chance home with them instead of making a separate trip. Their airline was accommodating to Chances needs, including cooking fish for his first meal in Canada and checking that the cargo temperature was comfortable for him. Hubbs said he heard from many people during their trip home who had similar stories about adopting dogs from abroad. "The customs individual in Toronto waived the entrance fee for an animal. Air Canada waived the fee for us to travel with a carrier. They also waived one of our extra bag fees to help us out with some of our extra expenses," Jason said. There are challenges with helping Chance acclimatize to a new culture and new country, let alone humans. "He's never formed a bond with another human being. He's never had a name. He's never had a home. He's never had any trust with any other human beings. That's a huge problem for him," Loralyn said. Eight weeks later, Chance has improved a lot but has a long way to go. He is in constant pain because of mange, which Loralyn likens to shingles for humans. His sores he has are still healing, making his skin very sensitive. "Going outside in the cold air is absolute agony for him." Currently the couple is working on trust with Chance. "He's trying to be closer to us, which we find encouraging, but we've got a long way to go before we can just get him out for a walk," Loralyn said. Chance is the couple's fourth dog, but the first from outside Canada. So far the couple's three other dogs have seemed to accept their new brother, but Chance is still unsure of them. Loralyn has already bought matching sweaters for the day all of their four dogs can go out for a walk. Some of the couple's friends have dropped off treats for Chance. Someone even brought a dog bed. "We have a friend from Chile who came over and spoke Spanish to Chance because he's used to hearing the Spanish language. She baked us empanadas on behalf of Chance for Christmas," Jason said. He said the couple has done all they can to help strays, both locally and internationally. "We're at our max right now. Some other people will have to step up and do some adopting throughout the world," Jason said.